This week I’ve worked on a really fun project as a gift for my mom. She makes the cutest little clothespin dolls ever, and I wanted to give her a place for them to “live” while we are selling at the farmer’s market. 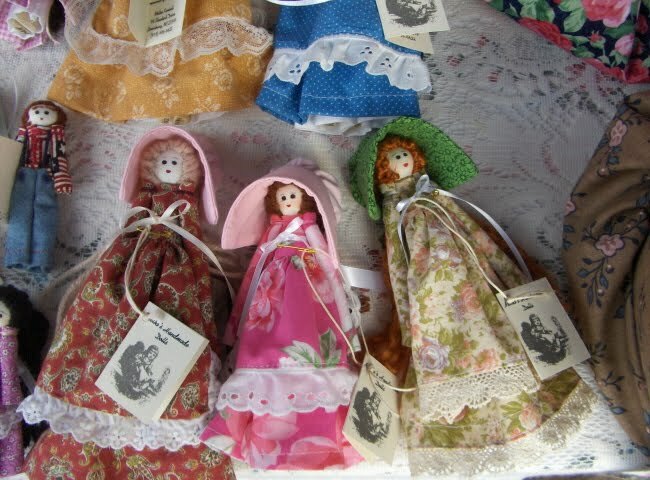 Here are some of my mom’s clothespin dolls. These are actually made from handmade “clothespins” that she carves from wood, so these are bigger than standard size, but she makes standard size too, just as cute! Not long ago I purchased a pair of shoes for one of my sons. They came in a great shoebox! Sturdy! And the top was attached to the bottom so that it would open and close like a chest. I opened the box as far as it would go, so that the lid was sitting back on the bottom (still attached–I did not separate the top from the bottom) and it made a two-story doll house. I hot-glued the top to the bottom so that I could then cover it with paper and decorate it! I used color coordinated papers from my scrapbook supplies and glued on “wallpaper” and “carpet.” To get the wallpaper just right, since the top had a curved edge (as you can see), I stood the box on end and traced around it to get the paper cut just right! One of my favorite things about this is the Victorian feel and the very Victorian dresser! 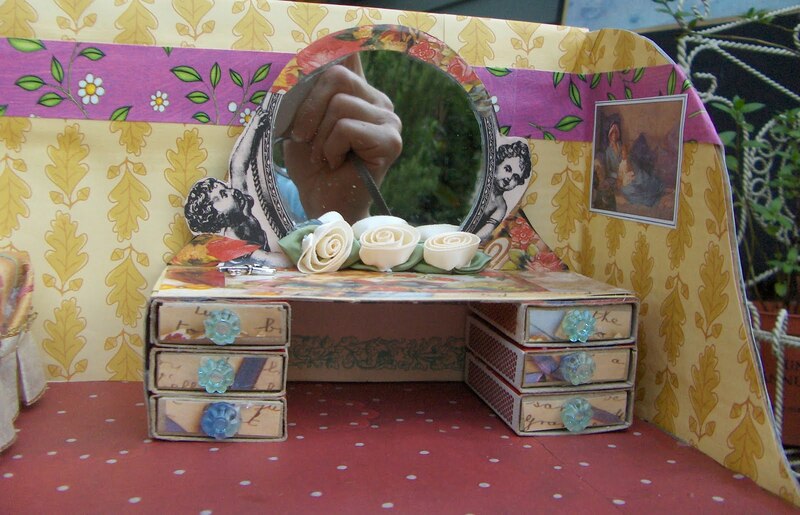 It has a mirror held up by two little cherubs and three little silk roses glued in front of the mirror. Ahhh, the little fireplace. Michaela and I made a recent trip to The Scrap Exchange, and one of the items in the bins were a ton of these “leather” coasters. I cut some up in the shape of a fire place and hearth and hot-glued them on. The hearth portion of the fireplace is three layers deep to give it the appearance of a real hearth. The basket is made from Sculpey and filed with real wood. The fire is from a picture, Mod-Podged into place of course! What an opulent little bed! 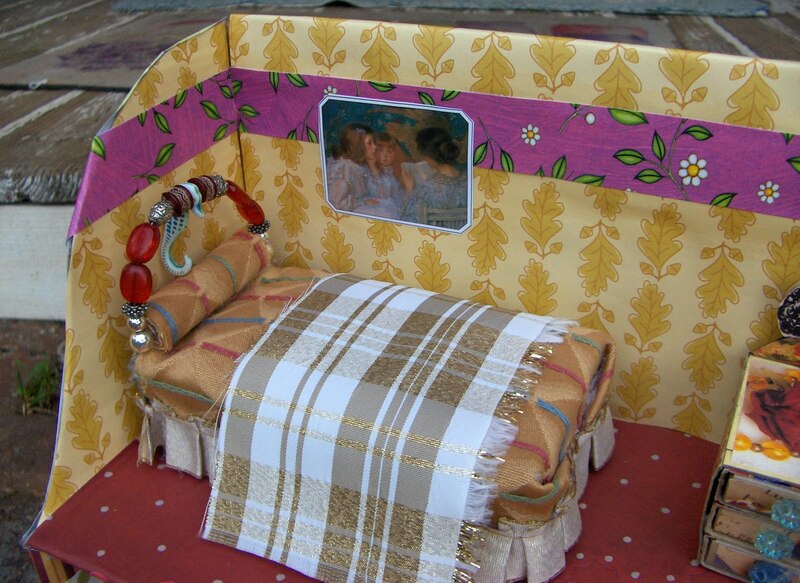 I found that an herbal tea box is the PERFECT size to make a bed for a clothespin doll. The bed is actually made from two boxes, cut down and glued back to back so that it’s open on the top and open on the bottom. The top got filled with old powder puff material from the scrap exchange. The headboard is made with heavy wire covered in bed and poked on each side through the box before hot-gluing on a pad, fabric, and a pillow. 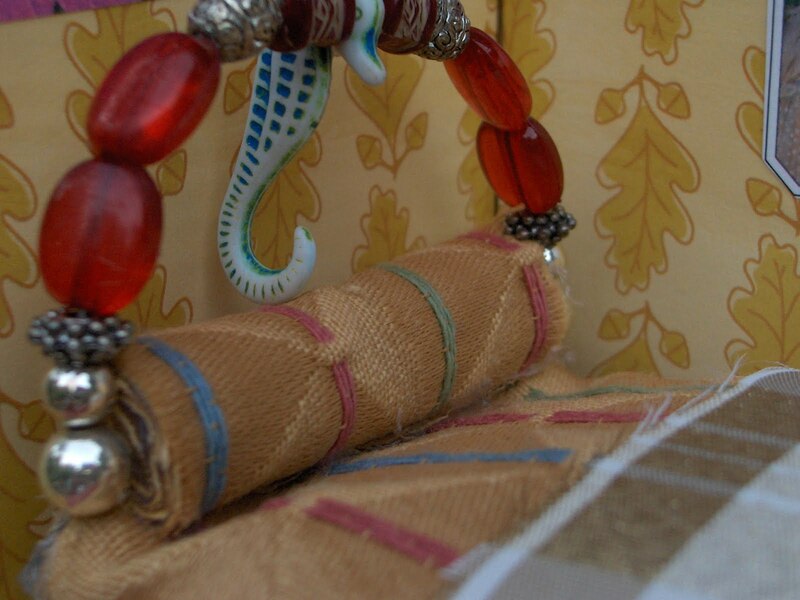 There’s even a seahorse watching over the little bed. 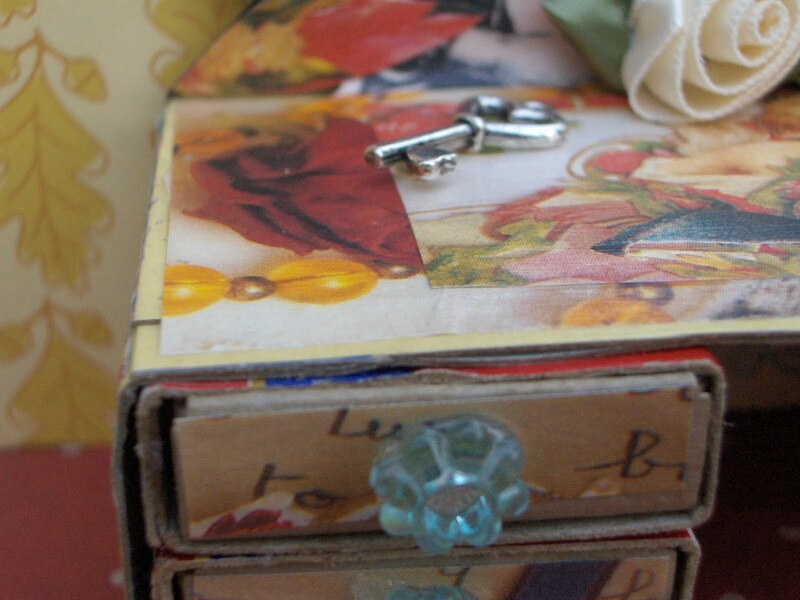 One of the finishing touches is a little key on the pretty Victorian dresser. 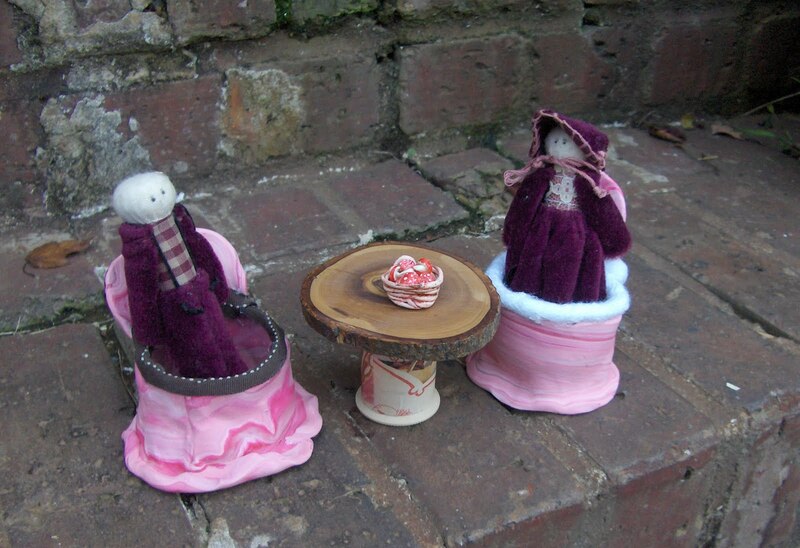 I had been turning over in my mind how to make a chair for a clothespin doll. Their legs don’t bend, after all. I finally hit on an idea with something we found — again — at The Scrap Exchange. You know the containers that things come in from gumball machines? The large containers? Well, I molded Sculpey around on to make a chair and then baked ONLY THE SCULPEY. Once the chair was baked, I pushed the little container down into the chair and hot glued into place. I trimmed the edges, one with ribbon and one with heavy cord. The back of the box is Mod-Podged with pages from an old (falling apart) copy of Little Women. 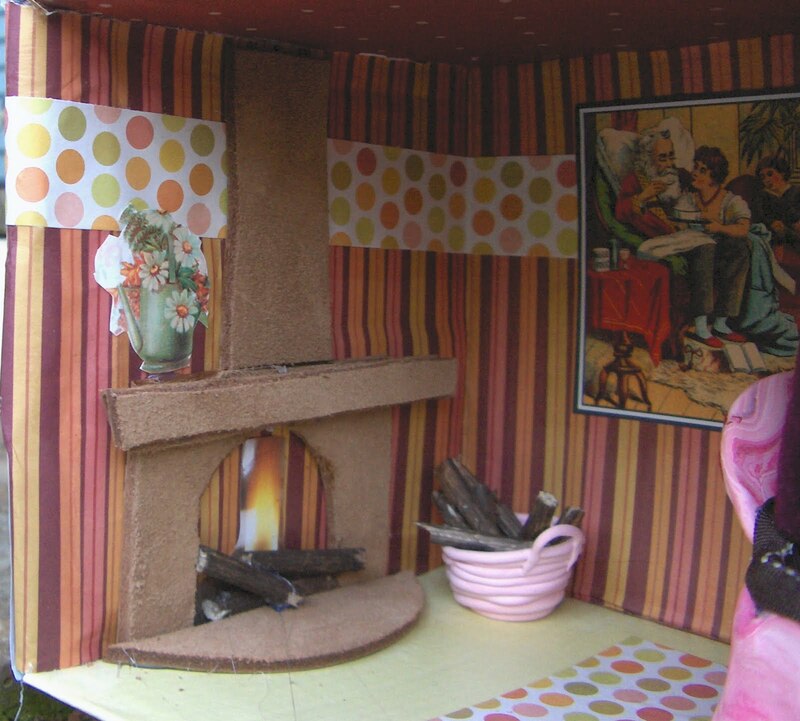 I can’t wait to see what the shoppers think of the Clothespin Dolls’ Shoebox Dollhouse.Have fun creating! This beats anything commerically prepared all to pieces. The creativity, the originality, the charm! This is the perfect house for your Mom's dolls, or anyone else's for that matter. I think these may have a niche' in the market as well as the dolls. Thanks for sharing this whimsical creation. WOW… you sure did a lot of work..but, i bet you were in your glory! no details left out! the farmer's market crowd will love the display, too! this is so adorable, Lynn! 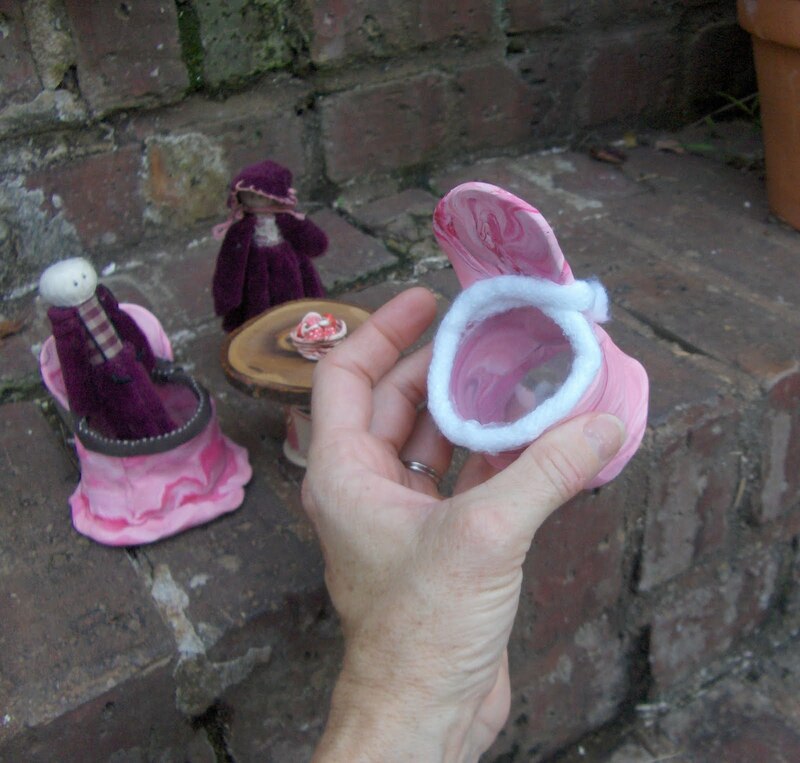 i will be sharing it with three little girls i know–who are busy the last couple of days making things from seashells. Your mom's dolls are adorable!!! I LOVE your blog and all of your creative ideas!!! 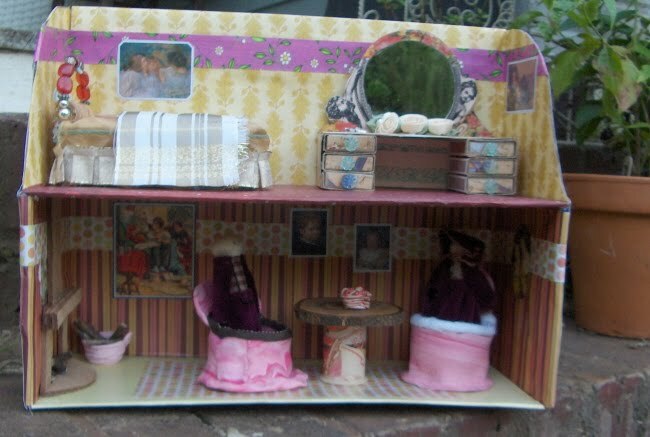 I had a much loved doll house for my Dawn Dolls (6-1/2 inch fashion dolls from the 1970s). 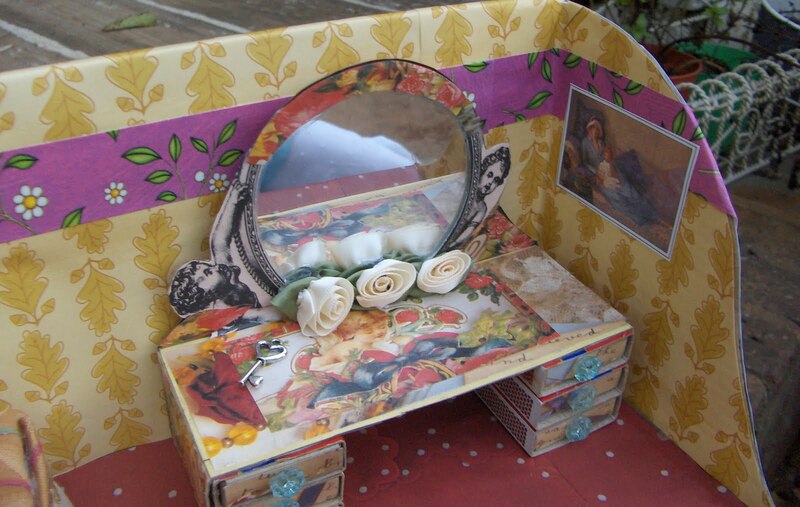 Your doll house furnishings remind me of some of the things I used to make for them. 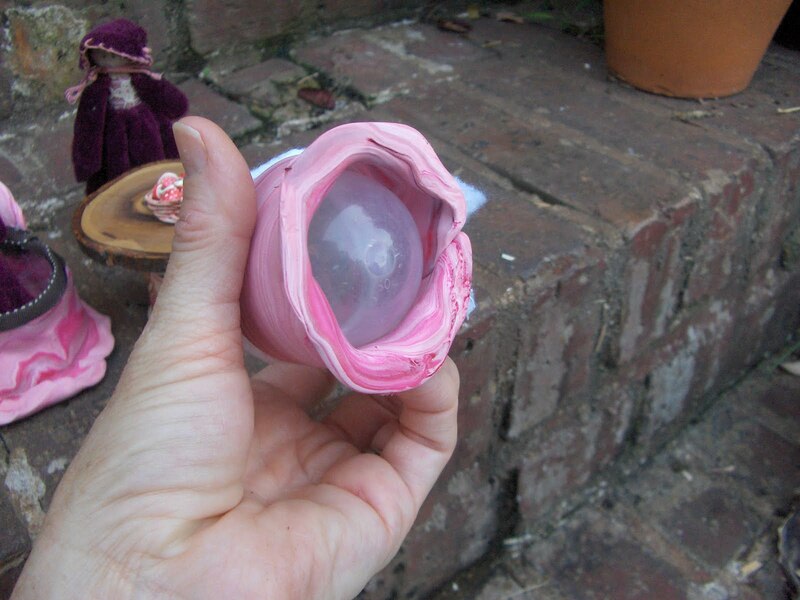 Say, have you ever made an egg carton "potty"? Just curious. Can't wait to see what you come up with next. So very lovely Lynn…I hope she loves it!